MTN has decided to increase the commission rate of its airtime borrowing service, MTN XtraTime from 10% to 15%. The new service charge which was communicated to its subscribers takes effect from October 11. Most MTN users got this text, “Kindly note that new Terms & Conditions for MTN XtraTime service will take effect from October 11, 2016. Please visit mtnonline.com/xtratime/terms for details”. The referred site lists out the terms of service but the obvious change is the “Item 7” which states that a service charge of 15% of the requested airtime is charged per successful request. 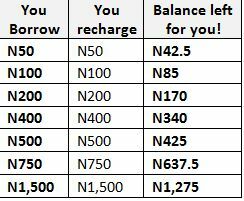 What this means now is that when you borrow N100, N15 will be deducted from your next recharge instead of N10 previously. This new rate of 15% leaves you with the following respective amount when you recharge. The reality in all these new rates is that whenever you borrow airtime, you have lost about 2 minutes of talk time (if you are on MTN Xtra Pro or Pulse) to service charge. My advice? Use QuickTeller wallet or your respective Bank USSD short codes to recharge any number directly from your bank account. This way, instead of losing money to service charge, you are actually rewarded with bonus data and airtime. Note that the MTN site erroneously state that you “will be credited 90% of the airtime requested”. You are actually credited with 85% of the airtime requested; the remaining 15% will be withheld as a service charge. MTN Xtra Time service can be accessed by dialing *606# on your MTN line. XtraByte (for borrowing data) is not included in this new development.